The Kafra Corporation is proud to announce the launch of their new Kafra Guide! The combined knowledge of the Kafra Corporation is now available at your fingertips. The Main Menu can be accessed by clicking its icon in the main drop-down menu. Each of the side tabs contain a menu of different information. The Getting Started tab will let you view the Introduction, The Story So far, and Using this Guide. 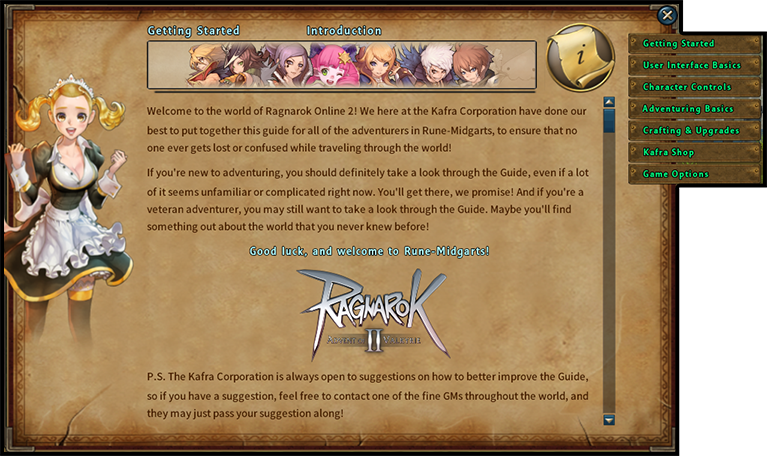 These starting guides will acquaint you with the world of Ragnarok Online 2. This tab will provide you access to the HUD Overview, Inventory, Character Window, and Quest Journal sections of the guide. If you need to know how to get around in Rune-Midgarts, select the Movement & Action menu! This menu will show you how to interact with the world. Now that you're ready to get out there and explore the world, you'll need to learn the basics of adventuring. This menu contains the Quests, Dungeons, Events, City Services, Kafra Services, Khara System, and Daily Rewards sections of the guide. These sections will help you become an efficient adventurer who is ready to make the most of your travels! As an established adventurer, you will find yourself coming across a variety of craft items and monsters. The Job Crafting, Cards, Refinement, Fusion, and Runes sections will provide you with information about how to craft, how to upgrade your equipment and cards, and how to become a stronger adventurer! This portion of the menu contains the Kafra Points and Shop Categories sections of the guide. These sections will introduce you to the special items that can be purchased through the Kafra Shop. Finally, the Game Option section will provide you with an Overview, as well as information about System Settings, Game Settings, and Keybindings. We hope that this guide will provide you with the information you need to become the best adventurer possible!